The UW Department of Family Medicine and Community Health’s (DFMCH) Eau Claire family medicine residency program transformed a recent experience providing prenatal care in Haiti into a new global health rotation. 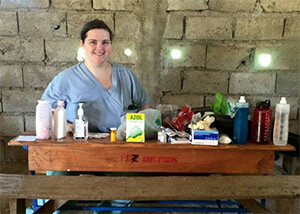 Jaime Stringer, MD, at one of the mobile clinics in Haiti. In July 2015, Eau Claire faculty Jaime Stringer, MD, residents Sakina Sachak, MD, Gretchen Adams, DO, and Sacred Heart Hospital’s Kris Simpson-Murphy, RN, volunteered with Midwives for Haiti on a two-week trip to provide urgent care, patient education, labor and delivery services and perinatal care at several medical sites in Haiti. Many people in Haiti do not have access to basic medical care and clean water; at times, even the hospital goes without electricity and running water. 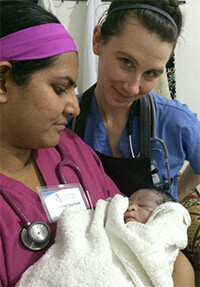 Sakina Sachak, MD, and Gretchen Adams, with a newborn baby they helped deliver. The team worked with local medical professionals at mobile prenatal clinics in rural villages, the Whitney Clinic in Hinche, and the hospital and maternal health center at St. Therese Hospital (also in Hinche). They also set up freestanding family medicine clinics in remote villages to provide care to hundreds of Haitians, many of whom had serious medical problems and had never seen a doctor. The working conditions were primitive and medical supplies were in short supply. The work was grueling and occasionally heart-breaking, but provided insight to the realities of global health challenges. Employees at the Eau Claire and Augusta Family Medicine Clinics showed their support by donating baby items and non-expired medical supplies. Nancy Accola, RN, sewed colorful receiving blankets from flannel yardage donated by fellow clinic employees. The team gave a blanket, onesie, and hat to each infant they delivered—basic items that many of the families could not provide for their babies. On August 8, 2015, Drs. Stringer, Adams and Sachak reported on their experience at Sacred Heart Hospital’s Grand Rounds. Their experiences have also shaped a new global health elective for Eau Claire family medicine residents. Second- and third-year residents will have the option to complete a two-week elective in Haiti; they can choose a broad experience or focus the elective on women’s health, obstetrics, emergency care, or general family medicine. Residents will also learn how to manage tropical diseases and work with very limited resources. Drs. Stringer, Adams and Sachak have been invited to present the new global health curriculum at the Society of Teachers of Family Medicine (STFM) annual spring conference in May 2016.